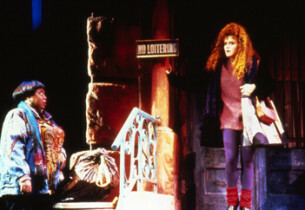 ACT I – OVERTURE Paula McFadden (Bernadette Peters), a single mother, and her twelve-year-old daughter, Lucy (Tammy Minoff), had reason to be excited today. Tony, an actor that Paula had been dating for the last few months, had promised her that today was the day that they would all move to California. Though Paula had been dumped many times in the past, this time she knew that with Tony everything was going to be all right. Her euphoria however, is short-lived, for Paula spots a note that he has written “Dear Paula … this isn’t an easy letter to write. This morning my agent called. I got a picture. It’s six months shooting in Spain … I wish I had something to leave you and the kid, but I’m dead broke … Goodbye honey.” (“No More.”) With no income to rely on, Paula reluctantly decides to go back to dancing, a career she gave up long ago. 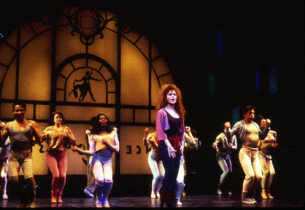 Returning to dance class, she comes to the horrible realization that she’s a “Beat Behind.” As Paula limps home from class she runs into Mrs. Crosby (Carol Woods), the manager of her building. “You leavin’ tonight or in the morning?” Mrs. Crosby asks. Paula realizes that she has forgotten to notify her that they are not going to California. Mrs. Crosby then adds insult to Paula’s dance class injuries and tells her that Tony has sublet the apartment to his friend Elliot Garfield (Martin Short). That evening Elliot (who has come to New York to star in an Off Off-Broadway production of Richard III) shows up to establish occupancy. What to do? “The only solution is to share the apartment,” Elliot suggests. Paula is forced to accept. She reasons that she will be looking for a job during the day, and Elliot will be performing at night, therefore, with any luck, they probably will never see each other. Paula explains the rules of the apartment, but Elliot will have none of them (“My Rules / Elliot Garfield Grant”). Elliot goes into his bedroom while Paula and Lucy go into theirs. They all evaluate the realities of their predicament (“Good News, Bad News”). The next day, Paula asks Lucy, “Did it ever bother you about Tony and me? About living with him and not being married?” Lucy responds sympathetically, “Just like if it happened to me when I grow up, you’d understand.” “The hell I would,” Paula retorts (“Don’t Follow in My Footsteps”). Elliot offers to pay all the living expenses until Paula finds a job. “And what do you get?” Paula asks, “All you have to do – is be nice to me.” Paula totally misconstrues his answer. By now, she has lost faith in every man. So when confronted with a decent one, she can’t even recognize it (“How Can I Win?”). The director of Richard III has decided to go wildly out on a limb. “Glenda Jackson played Hamlet, Judith Anderson played Hamlet. To me, that’s superficial. Let’s go one step deeper – Elliot, I want you to play Richard as a man, playing a woman, playing a man.” When Elliot invites Paula and Lucy to opening night, Lucy asks, “Don’t you get the girl in the end?” Elliot answers, “I am the girl in the end.” (“Richard Interred.”) The opening night is a total disaster, but Paula can’t help admiring Elliot’s dedication to his work. And in doing so, she begins to realize that she’s falling for another actor. ACT II – ENTR’ACTE The bad news is … the opening night reviews are in. The New York Times writes: “In Elliot Garfield’s His and Hers performance, one wishes the hump were in his throat.” The Daily News states: “This Richard III makes La Cage Aux Folles seem like The John Wayne Story.” And according to another critic, “playing Richard as a man, playing a woman, playing a man emerged as Bugs Bunny playing Miss Piggy, playing a French poodle.” The show closes after one performance. The good news is that Elliot and Paula are beginning to actually like one another – “Good News, Bad News (Reprise).” Meanwhile, Paula has gotten a job doing some dancing on a television nutrition show with her two friends Jenna and Donna. They will represent all the wrong foods (sweets, fats and fries). But beware, they’re sooo tempting (“Too Good to Be Bad”). Elliot and Paula realize that they are beginning to like each other more and more. Elliot gushes, “I love dating girls who live in my apartment. I get home so early” (“Who Would’ve Thought?”). He invites Paula to meet him on the roof for a romantic dinner for two. Dressed in a white dinner jacket (a la Bogart), Elliot has concocted an electric moon, Christmas light stars, and of course, a sumptuous dinner … pizza. When Paula arrives, he turns on his cassette player. “What now, a Gershwin tune?” she wonders.” “No,” he replies, “a Garfield melody … I love improvisation” – “Paula (An Improvised Love Song).” Suddenly there is a bolt of lightning and a crack of thunder. “Now we’ll have to have our pizza in the kitchen,” Elliot says. But Paula has an altogether different room in mind. The next morning, Lucy, aware of what has taken place, is scared. She knows that this has happened before with other actors and she cannot help but be worried that the Goodbye Girl Syndrome is about to resurface. And Paula can’t and won’t hurt Lucy again. Elliot asks: “What would it take to show you that I am serious, major league, world’s heavyweight champion contender?” “Get Lucy to say it’s all right,” Paula replies. 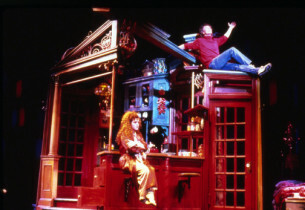 Elliot takes Lucy for a rowboat ride on Central Park Lake, and sings “I Think I Can Play This Part.” Paula has been promoted to the position of choreographer for a PBS show. She’s in the middle of putting the dancers through their paces when Elliot calls and tells her of the good news. Lucy said yes (“Jump For Joy”). Paula returns home elated, knowing that she has found a man who has been true to his word … but has he? Lucy tells her that Elliot is in the bedroom packing. When Paula sees him, he’s flushed with excitement and explains that he’s gotten a job in a movie … “it’s a love story. An adventure love story. A mystery comedy adventure love story.” Elliot has jumped the gun. Without conferring with Paula he has decided that they be married in British Columbia and that she and Lucy spend the next six weeks with him on location. But Paula can’t go. Lucy is in the middle of her school year and Paula has her own commitments. But she reassures Elliot that she’ll wait. “For the first time in my life, a man is leaving me and I’m not scared.” Elliot storms out of the apartment. “Don’t tell me you blew it,” Lucy asks. “I don’t know,” Paula answers. “That’s up to him.” Lucy responds, “I hate it when we leave it up to the guy.” But, Paula realizes that this isn’t any ordinary guy (“What a Guy”). On the way to the airport Elliot decides to see Paula at her apartment. When he gets there, he thinks better of it and decides to telephone her from the corner. Using her portable phone on her second story fire escape, she becomes aware that they both are very much in love. They know that they can weather a six-week separation. Elliot climbs the fire escape to join Paula and Lucy. As he embraces them and kisses Paula, the curtain falls (“Finale”). 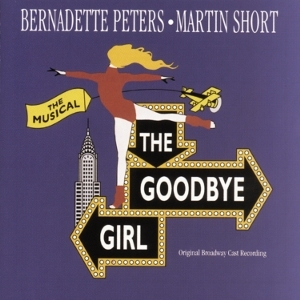 Based on his original screenplay for the eponymous 1977 film, Neil Simon turned The Goodbye Girl into a Broadway musical – with a score by Marvin Hamlisch and lyrics by David Zippel – which opened at the Marquis Theatre on March 4, 1993. 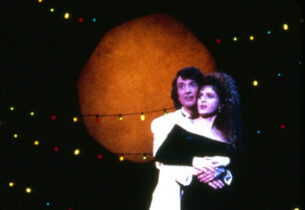 The story of an actor who sublets a friend’s apartment, only to find out that he has to share it with the friend’s girlfriend, a former dancer, and her daughter, it starred Martin Short, making his Broadway debut, and Bernadette Peters, with Michael Kidd directing and Graciela Daniele choreographing. 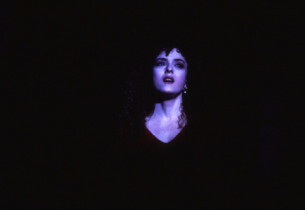 Reviewers and audiences proved only mildly interested in the show, and it closed after playing 188 performances.